Oversized, a bit too much. Very pretty but I was hoping for a silkier quality fabric. This Whitman five piece bedspread set from Madison Park is jacquard-woven in a paisley pattern in a combination of hues of soft blue, taupe, and platinum. The set includes a decoratively stitched bedspread, two standard pillow shams, and two embroidered decorative pillows. Machine washable. Exactly what I wanted as far as color , design, texture, etc. Thought it would be larger, but only because I did not measure, assuming that I had a normal king size bed. We had just traded in a 16 inch high mattress for an 11 inch high one, but we also bought and adjustable bed frame and I didn't realize how high that made my bed, so the length was fine but the sides don't touch the floor. At first, I thought I would send it back but after much internet shopping and research I learned that even an oversized king would still no be wide enough and in shopping saw lots of pictures of beds with the bedspread being about 6 inches off the floor. I decided to embrace the look and after a week, not only have I gotten use to it, but I have decided it's a much cleaner look, and it's easier to clean under the bed. Now I love it! But with all of these new mattresses and bases being so much higher, manufacturers might need to start addressing the width of bedspreads. Searched and searched for a bedspread that would fit my king size bed and 15 inch mattress. Finally found this one, and I mean FINALLY!!!. Good weight. Priced very reasonably. Gorgeous in appearance and fabric seems to be well constructed and a lovely addition to the bedroom. Have not washed since just arrived but as far as I can tell it will hold up nicely when washed over a comforter that bunches. Very pleased with the size it fits to the floor on a California king bed that has a 15 inch mattress. Could not be more pleased with the product and it was a great price. Nice quality. We have a huge dog that sleeps with us and I was afraid he would snag it, nope! It is holding up awesome. One thing though... this is oversized so don't worry about going up a size to cover your bed completely. We absolutely LOVE this bedspread! The fabric pattern and colors are scrumptious! I love that the shams are king size to go with the bed size. It makes it fun to make our bed. Arrived safe and on time. Not a flaw and fair price! Like others I wish the sides were longer, but we make it work. 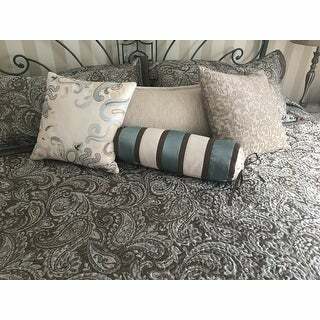 It is supposed to be a 5 piece set (bedspread, 2 shams and 2 pillows) I only received the bedspread and 2 pillows. I did contact them and they are supposed to ship the shams to me. The bedspread is long enough to cover my pillows however it is a little short on the sides. I thought I had an average size mattress (judging by mattresses that are for sale in the stores) so I guess this is made for more of a thinner mattress. ****Update: They could not send me just the shams so it was either take a 10% discount, send it back for an exchange or send it back for a refund. I have updated this to go ahead and give them 5 stars as I realized that it was not Overstock's fault that the shams were missing and they did give me options to fix it (although it is kind of hard to exchange something when they are sold out since quantities are generally limited on most of their stuff) So as far as customer service, it was good. 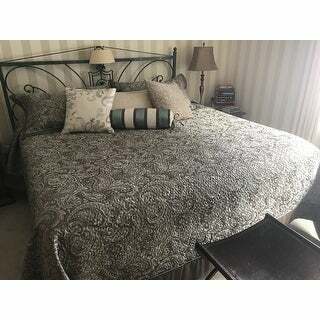 I have been looking for a king size bedspread for years and this one is absolutely PERFECT! The "quilting" on the spread and shams is done in a very small "pattern" so it looks so elegant. I have an 18"high mattress so the spread is off the floor about 4-5" but it still looks beautiful. I love the decorator pillows that were included. The whole set is just perfect for my master bedroom. The color is very neutral, dark taupe, cream, light blue and taupe. I would highly recommend it. Very high quality especially for the price! I've priced just a bedspread for $300-$400. The Bedspread set is a very good quality. The colors are excellent and match my bedroom as displayed on the page. I also ordered 2 pillows and the pillow shams just made it look more elegant. I am so glad my choice was just right!!! Love the bedspread and pillows. This is a Beautiful Bedspread. Made my room looks so good. Price was low but looks very expensive. Love it and would definitely recommend! My husband favorite bedspread. So elegant. Very nice looking spread. Does snag easily. Not incredibly warm, but overall very happy with the purchase. This bedspread set is so luxurious. My bedroom feels more like a boudoir with it on my bed. I get compliments on it all the time when my friends see the set. Great purchase. I was shopping for a bedspread for months and I finally found one. This bedspread is BEAUTIFUL and is everything I was looking for. The colors are perfect and the fit was perfect! We have a high mattress and everything I picked up was too short. I purchased it in a queen size and it fit just right. This bedspread and sham set is beautiful. The blue is more of a light blue-ish smokey teal - very pretty. It is also very durable. The corners at the foot of the bed flare out as shown in the picture, which is very elegant looking. "Will you have king size available again?" I need a bedspread that reaches the floor and hopefully this one will! I also love the soothing tones and the elegance of the fabric. Do not like accent pillows--need to do a taupe with blue accents, more like roll pillow. I will cover accent pillows with another fabric. Keeping my fingers crossed that this is as beautiful in person as it is in photos! Thank you. It was the perfect color combo I was looking for with an oversized fit for my king sized bed. "Can you machine wash this or do I have to have it dry cleaned?" Bedspread is machine washable. The dec pillow is spot clean. So it is not necessary to dry clean.